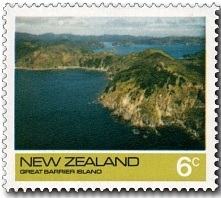 1974 - Scenic Stamps - Offshore Islands. See the full collection - Scenic Stamps Series - Part One. 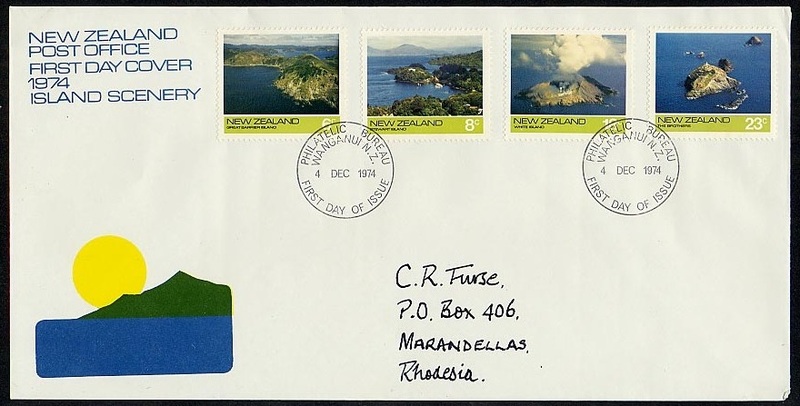 Following on with the scenic theme of this series, in 1974 four offshore islands were featured. Once again I good variety were selected from the larger Great Barrier Island and Stewart Island to the active volcano White Island. 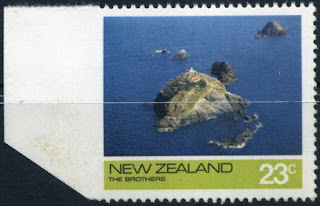 The final stamp was the tiny Brothers Islands from Cook Strait. Notes on this page were based on notes from the NZ Post Web Site. 6c - Great Barrier Island. Great Barrier Island, known to the Maori as Aotea - the land like a white cloud - was first sighted by Captain Cook in 1769. Some 259 square kilometres in area the island lies 88 kilometres north east of Auckland. Though its highest point (Mount Hobson) is only 621 metres, its surface is extremely rugged with rock bluffs rising steeply from the sea especially along its western shore. Settlement is restricted to scattered clusters on the margins of this rugged island, notably at Port Fitzroy and Okiwi in the north west, and at Onawa, Oruawharo, Okupu and Tryphena in the east and south. Proximity to metropolitan Auckland makes the island attractive as a holiday resort. Below are two of our posts worth checking out. Great Barrier Pigeon Post. Wreck of the Wairarapa. 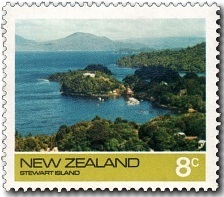 Stewart Island was known to the Maori as Rakiura 'The Island of the Glowing Sky'. It received its present name from William Stewart who was the first officer of the brig Pegasus which called there in 1809. Separated from the South Island by Foveaux Strait the total land area is approximately 1735 square kilometres. The coastline is very ragged, deeply penetrated by the branching Paterson Inlet in the north and Port Pegasus in the south, and fringed by rocky offshore islets. Most of the permanent residents of Stewart Island live in the township area around Halfmoon Bay. Some 40 per cent of the residential buildings are holiday houses or cottages. 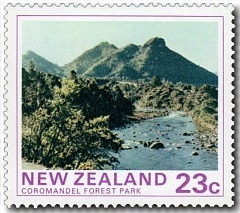 The view shown on the stamp is from Observation Point. Known to the Maori as Whakaaii, the meaning is obscure. It was first sighted by Captain Cook on 31 October 1769. "I have named it White Island because as such it always appeared to us". 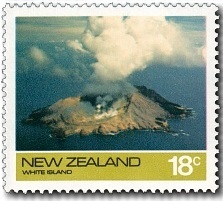 White Island is a rhyolite volcano which forms an island in the Bay of Plenty 51 kilometres north of Whakatane. White Island lies at the northern end of the Taupo-Rotorua Volcanic Zone within which occurs the bulk of New Zealand's modern hydrothermal and volcanic activity, although the zone is by no means the only active volcanic zone. See our post 2000 The Volcanic Taniwha Sisters. The Brothers are a small island group situated in Cook Strait. The lighthouse on the Brothers is the nearest to an English light station such as Eddystone or Wolf Rock that there is in New Zealand. The light was first operated in September 1877 and was electrified in August 1954. Standing 78.6m above sea level the tower is 12.4m and the light, flashing each 10 seconds is visible for 35.4 kilometres. Tuatara, a nocturnal reptile, and one of New Zealand's most unique animals, inhabit The Brothers as well as the adjacent Stephens Island. The Tuatara is the only surviving representative of an otherwise extinct order of "beak headed" reptiles, the Rhynchocephalia, which lived some 200 million years ago in Asia, Africa, Europe and North America and became extinct more than 100 million years ago. See also 1947 Government Life Insurance Lighthouses. 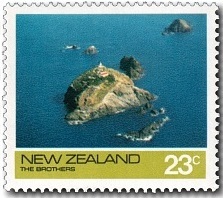 1974 23c The Brothers Island - A single stamp imperf down left side. case there is an address but the cover appears to tidy to have travelled all the way to Rhodesia. 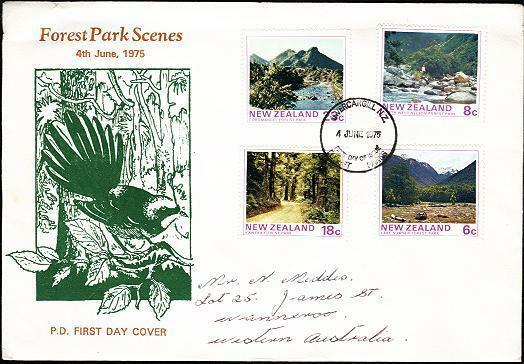 1975 Scenic Stamps - Forest Parks. 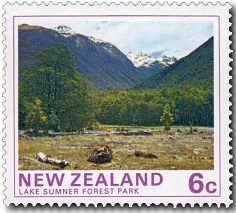 The 1975 Scenic Issue featured Forest Parks, two from the South Island and two from the North Island. The Forest Parks of New Zealand are on public land administered by the Department of Conservation. Forest parks have a less stringent level of protection than National Parks and they are used for a wide variety of recreational and commercial activities. 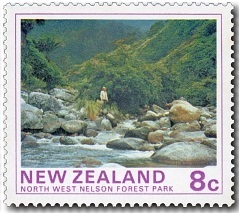 Since these stamps were issued, the North West Nelson Forest Park (8c) has been up graded to become a National Park. 6c - Lake Sumner Forest Park. Eighty miles north of Christchurch, forming a spectacular backdrop to Lake Sumner, lie the forests and mountains of Lake Sumner State Forest Park. In a track of 74,000 hectares occupying the catchments of the Hope and Upper Hurunui Rivers extending to the main divide, all the ingredients are present for extensive public recreation. From stark eroded mountain peaks, snow capped in winter, through alpine herb fields, red, silver and mountain beech forests, the tramper and hunter can find pleasure in the tranquillity and beauty of the landscape. 8c - North West Nelson Forest Park. This State Forest Park lies in the north west corner of the South Island with its nearest boundary from Nelson City 65 kilometres due west. The park, incorporating 8 State Forests, totals 358,841 hectares including 10,927 hectares of crown land and scenic reserve. Approximately 83 percent of the total area is under a forest cover. The remainder consists of rocky peaks, alpine herb fields and lowland pakihi scrub associations. Two well known tramping routes in the park are the Heaphy and the Wangapeka Tracks. The North West Nelson Forest Park was designated a national park in 1996; renamed Kahurangi National Park. 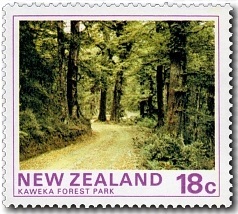 18c - Kaweka Forest Park. This park of 61,000 hectares, lies in the Kaweka Ranges east of the Ngaruroro River, 65 kilometres north east of Napier. This park was gazetted in January 1974. The Ngaruroro and Mohaka Rivers are stocked with trout, but the fishing potential is relatively untapped. 23c - Coromandel Forest Park. 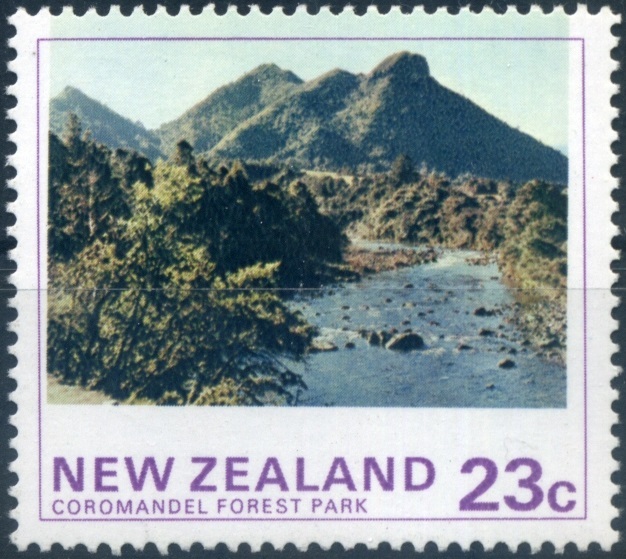 The 65,000 hectare Coromandel Forest Park was created in 1971. The forest is predominately rimu and tawa but there are also kauri, miro, totara, kahikatea, matai, pukatea, rewarewa, towai, hinau and kohekohe. 1975 18c Forest Park - Dark blue colour omitted. I wonder if in fact it could be that the boarder and perforation as been moved downwards. The four colours that make up the photo appear to line up so its likely they would have been done together on a four colour printing machine. Then in a second process the purple boarder and perforations could have been added together since they appear to line up with each other. Either way, we are left with this interesting effect. Now here we have two First Day Covers. The top one appears to have been properly address and sent through the mail system. 1974 Scenic Issue Technical information. 1975 Scenic Issue Technical information.